Dr. Angel is currently a Society Fellow at Cornell University Society for the Humanities, working on the research theme Skin from August 2016 ~ July 2017. Her project explores histories of flaying, and the manufacture of artefacts from human skin. The theme of flaying recurs in the ancient myths and legends of many cultures from the Aztecs to the Ancient Greeks, as well as in documented cases of ritual practice and penal punishment from eleventh-century England to twentieth-century Mongolia. In contemporary culture, flaying continues to be a powerful phantasm, appearing in horror films such as The Martyrs (2008), and in popular fiction as an extreme form or torture, as well as a theme within artworks that explore the interstices of identity, skin, self and body. The cultural significance of the skin is frequently most legible were it is breached, broken and stripped away; thus the theme of flaying provides a potent symbolic lens through which to examine shifting historical and cultural readings of the skin. The skin can be both mask and mirror, simultaneously concealing and exposing the interior; protective armour or vulnerable membrane; a garment imbued with powers of renewal, as in the ritual practice of the Aztecs in honour of fertility god Xipe Totec; or alternately, in the Greek myth of Nessus, a poisoned second skin that possesses the power to flay its wearer alive. 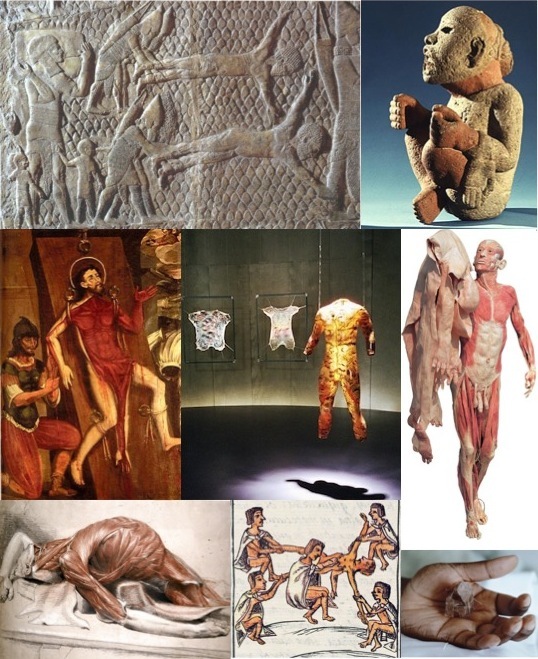 This project explores representations of flaying in ritual practice, mythology, medicine, art and literature from the Ancient world to the modern day, including contemporary film and bioart practices using skin, as well as examining the use of the flayed skin in folk medicine and magical practice. The project is unique in terms of its historical scope and interdisciplinary approach, and in its focus on a number of historical artefacts manufactured from human skins, which have never before been studied. The Body Stripped Bare constitutes the first in-depth, interdisciplinary analysis of practices and representations of flaying and the fabrication of the flayed human skin into objects of use and display, across historical periods, geographies and cultural contexts.